—It has Moments. Like what follows when Gale is flogged. And the supposed wedding dress reveal. 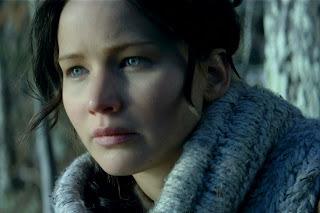 And when Katniss has a clear shot of Finnick. —It has funny lines. Just enough and well placed. —Jennifer Lawrence has more to do emotionally, and she nails it all. —Peeta inches up the hotness scale from the last movie. The flops of Beautiful Creatures and City of Bones show that it's not so easy to make these YA series work as movies. I'm so glad this series does. We'll see how Divergent does in March. How does it compare to the book, if you've read it? I can't remember much detail about the book, but there weren't any moments where I thought, "I can't believe they left that out!" Or "I can't believe they changed that." I think it was pretty faithful in spirit and in the general outline.